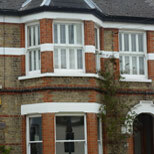 We have been restoring and replacing timber box sash windows since 1998. Whether you need a sound proofing, double glazing or rot treatment, all our highly skilled craftsmen always work carefully so that your period home looks exactly as it did when the windows were first installed. Our facilities include everything from basic sash window service to authentic timber replicas with exact wooden replicas of the originals in Sutton and surrounding areas. Whatever your sash window problem, we have a solution so get in touch with us today to find out how we can help. I originally paid a local guy repair the sash windows. He did a very poor job and actually damaged some of the windows. The Sash Window Man came out and repaired the damage and now the windows work perfectly. I wish I had used them in the first place, instead of taking the risk of going and finding myself in the hands of a rogue trader. 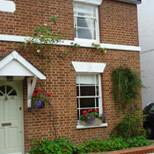 We replaced the ugly plastic windows in this cosy home with new timber sash windows. We prefer to repair and service existing windows wherever possible, saving cost and timber whilst maintaining the authentic look of your house.